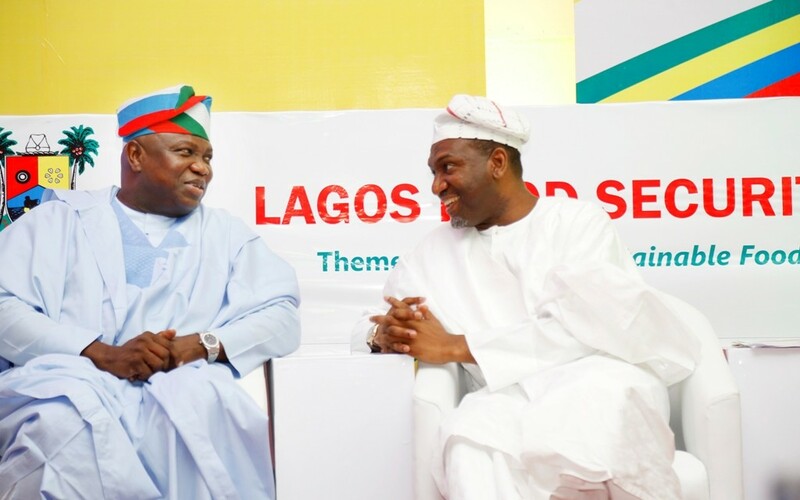 Lagos State Governor, Mr. Akinwunmi Ambode on Saturday said that contrary to the view held by most people, recession was not a crime but a period that calls for government at all level to rearrange its expenditure and give more priority to capital expenditure. Governor Ambode, who spoke at the opening ceremony of the Biennial Convention of the Nigerian Guild of Editors (NGE) held in Ikeja, Lagos with the theme, “A Nation in Recession: Whither the Nigerian Media?” sighted example of the steps the former U.S President, Barak Obama took few years ago to save the ailing American economy, saying that Nigeria must be ready to toll such line. The Governor said, “Recession is not a crime, it’s just a notice to say that you rearrange the way you do your public expenditure. That’s what President Obama did. Yes, there was a burst in 2008 and 2009 but he was very bold enough to put public money into General Motors and even the airlines and that is what is missing in this country. 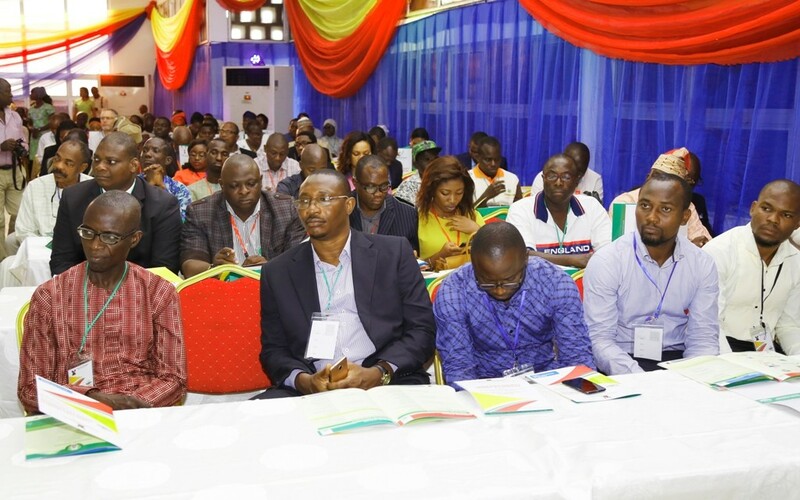 Governor Ambode said the State stood in the gap for Nigeria during the period of the economic recession, assuring that his administration would continue to show leadership, demonstrate capacity and be relentless in its pursuit of excellence despite the daunting challenges. He said the current recessionary climate not only taught some hard lessons but presented a new challenge as well as an opportunity to think outside the box to change Nigeria’s story from “business as usual” to “business unusual”. He said with the recession, the rate of unemployment soared as a result of the economic outlook, lay-offs and shut-down of businesses stating that the national unemployment rate rose to 13.9 percent in 2016 from 10.4 percent in 2015; while the unemployment rate in Lagos State increased from 18 percent in 2015 to 27 percent in 2016. But the Governor said that his administration took definite steps to arrest the trend, recalling that on assumption of office, he created new ministries while some while realigned in a bid to fashion out ways of creating job opportunities for residents. Besides, Governor Ambode said what his administration did in the last two years was to commit huge resources to capital projects, premised on the fact that the nation had no choice but to spend its way out of recession and create platforms that will stimulate job creation and decidedly reflate the economy. “Today, with our GDP at US$136billion, Lagos is Africa’s fifth largest economy just because we have been prudent and resilient as well as taking on board the useful opinions and analysis that the vibrant media have ceaselessly provided.,” the Governor said. Governor Ambode also said that despite the shortfall of federal transfers occasioned by the dip in oil prices, his administration made conscious decisions to partner with the private sector through Public-Private Partnerships (PPP) to bridge the funding gap to deliver key/strategic infrastructure projects especially the Fourth Mainland Bridge; Oshodi Transport Interchange; Badagry Deep Sea Port; Lekki free trade zone, and Lagos Smart City projects, among others. 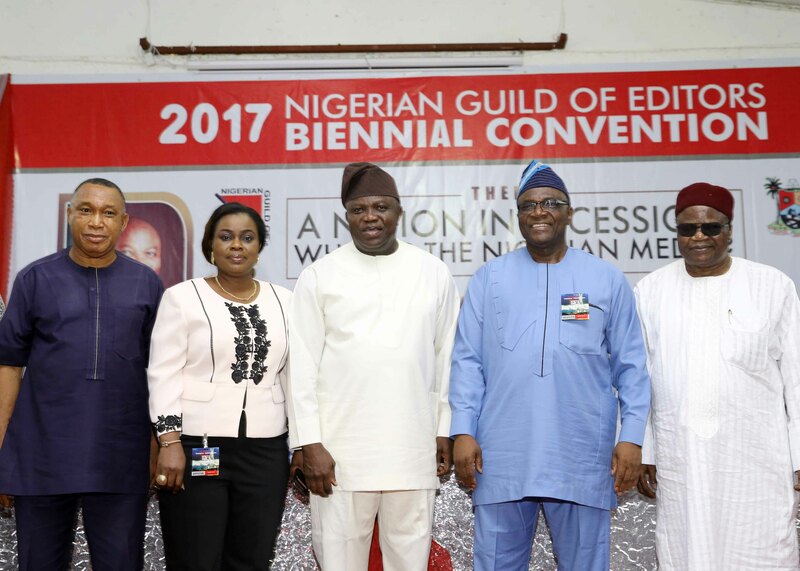 While commending the Guild of Editors for its outstanding accomplishments and contributions to the growth and development of the media and free speech in Nigeria, Governor Ambode tasked the media to live up to its major responsibility of advancing the cause of good governance. “Your role in this pursuit of resilience, therefore, is to lend the needed support in bringing our noble efforts to public consciousness. With your vital partnership, we are hopeful that other governments can borrow a leaf from the Lagos Model and translate same in their respective domains to promote good governance to the greater benefit of humanity,” he said. He assured that the State Government would not rest on its oars, but would continue to initiate and execute programmes that will make Lagos the investment haven of Africa and the tourism destination of the Continent. 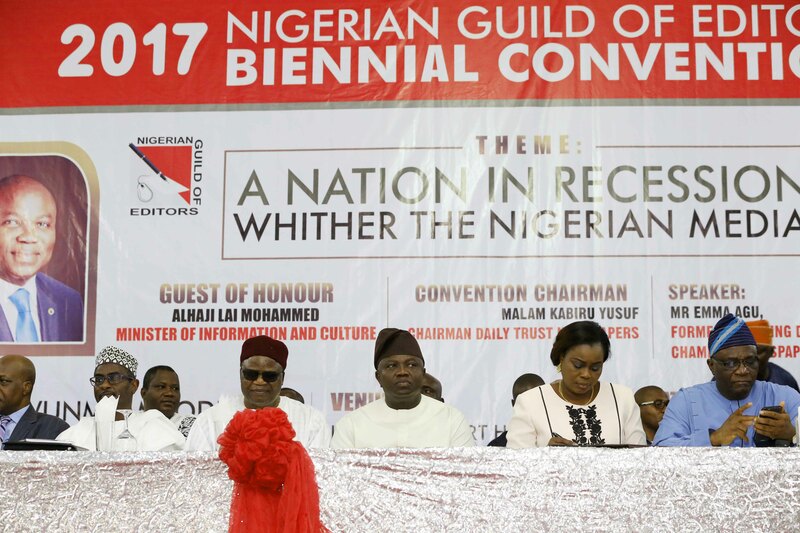 Earlier, President of the NGE, Mrs. Funke Egbemode, said the Convention afforded members to rub minds and fashion out strategies that would help to stabilise the nation’s economy, but also the media industry in business. The event which attracted the who’s who in the Nigeria Media Industry also saw the Guild conduct elections into various offices. As Christians in the country join their counterparts across the world to celebrate Easter, Lagos State Governor, Mr. Akinwunmi Ambode has called on Nigerians to collectively imbibe the spirit of love, sacrifice and peaceful co-existence, saying that it is only when such virtues exist that the nation can make meaningful progress. Governor Ambode, in his Easter message signed by his Chief Press Secretary, Mr. Habib Aruna, said such fundamental values would go a long way in promoting and strengthening the foundation of love, peace and harmony in the country, adding that the season should serve as a reminder to all of the selflessness, love, sacrifice and tolerance of Jesus Christ throughout His earthly sojourn, his death and his resurrection. 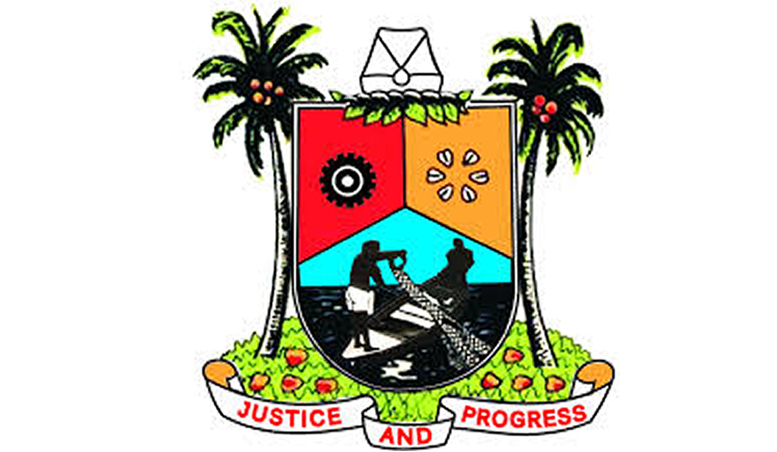 Noting that this season calls to mind the selflessness, love and tolerance which were the hallmark of Jesus Christ during His earthly life, Governor Ambode said, “It is a season when we should pause and reflect on our individual and collective roles towards promoting and sustaining that foundation of love, peace and harmony in our society”. He said there was no better time for the country to unite together and eschew resentment along ethnic and religious lines, adding that no challenge is insurmountable where there is unity of purpose. “No doubt, Nigeria will surely make faster progress towards the achievement of the peaceful, united, strong, progressive and prosperous country that we all desire if, as a nation, we eschew all divisive, parochial, ethnic and religious sentiments and rivalries, and begin to live more harmoniously with one another, as Jesus Christ enjoined us to. Governor Ambode commended Lagosians for their continued demonstration and promotion of mutual understanding and peaceful co-existence in spite of existing ethnic, cultural and religious diversities, attributing the successes recorded in the State’s 50 years existence to unity of purpose among residents. “Today, we can tell the world the enthralling story of how our beloved City-State has become a shining example of what peaceful co-existence can help to achieve. Lagos is home for all, Lagos is a land of opportunities, Lagos gives life to dreams and Lagos does not discriminate. Every Nigerian has a root in Lagos and in another 50 years we hope we would have left a legacy for our children to build upon. While wishing all Lagosians a happy Easter celebration, Governor Ambode enjoined them to continue to work with his administration “by obeying the law, fulfilling your obligations as citizens and stakeholders, and remaining vigilant, to ensure that our State remains a model of peaceful and harmonious co-existence in our dear country, Nigeria”. 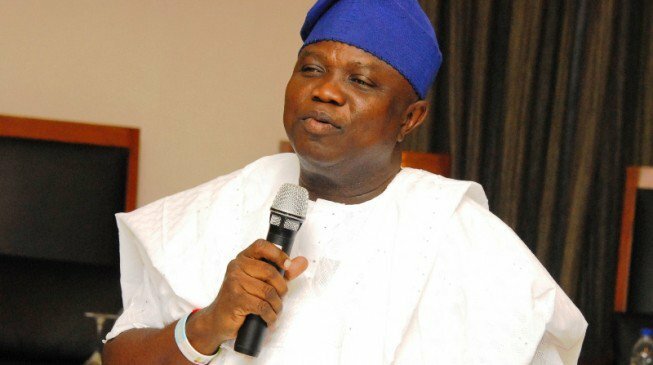 Lagos State Governor, Mr. Akinwunmi Ambode on Sunday attributed the steady growth of the State in all sectors to God’s intervention, just as he said that with divine direction, the State will continue to experience pleasant surprises all year round. Speaking at the special Thanksgiving Service to usher in the New Year held at the Lagos House in Ikeja, Governor Ambode recalled the bleak economic outlook predicted for 2016 and his assurance that the State would against all odds make appreciable progress, saying that with God’s guidance, the State witnessed quantum leap in major sectors of the economy. The Governor said: “Exactly a year ago, we were gathered here. Recall as part of my wishes, I had stated that despite the bleak economic outlook predicted in many quarters, Lagos State will grow in leaps and bounds and be prosperous. “No doubt, God has been faithful. As we covert greater prosperity for all of us here and the State this year, we are confident that our God will never fail us. Lagos State will witness pleasant surprises in every sector in 2017. We are determined and God willing, we shall continue to achieve an all-inclusive progress and prosperity in the State. While alluding to the significance of this year’s Thanksgiving Service which coincided with the State’s Golden Jubilee Anniversary, Governor Ambode said the God has indeed been faithful to the State in the past years, and as such it was important to show appreciation and supplication to God. He said the service, irrespective of religious affiliation, also offered the opportunity to reaffirm faith in God and belief in His grace to make the hopes and aspirations for the Year become a reality. “We believe that as we are gathered this evening to praise Him and glorify His Holy name, new doors and windows of opportunities shall be opened for us as individuals, as a State and a Nation. “We want to officially welcome all other States and Governors to the Year 2017. We join hands together as Lagosians to wish Mr. President, Muhammadu Buhari, who had once worshipped here with us in the past, Happy New Year, and pray that God will honour him as he leads the ship of the nation to its rightful destination,” he said. Besides, Governor Ambode, who thanked spiritual leaders for their ceaseless prayers and wise counsel, prayed for God’s anointing to continually flow in their lives, while urging Nigerians to continue to pray for the State, the country and leaders in the country, especially to ensure a nation that all would be proud of. In his sermon, General Overseer of The Redeemed Christian Church of God (RCCG) Worldwide, Pastor Enoch Adeboye said for people to experience a new beginning, they must be willing to follow God completely and serve Him in truth and spirit. While drawing his text from Exodus 3:1-8, Genesis 18:1-8 and Mark 10:46-52 among others, Pastor Adeboye also admonished Nigerians to leave the camp of the devil and embrace God’s camp, as well as accept the invitation of God. The service also featured music ministrations, bible readings and prayers for the State Governor and his family, the Executive, Legislature and the Judiciary as well as for the Federal, State and Local Government parastatals. 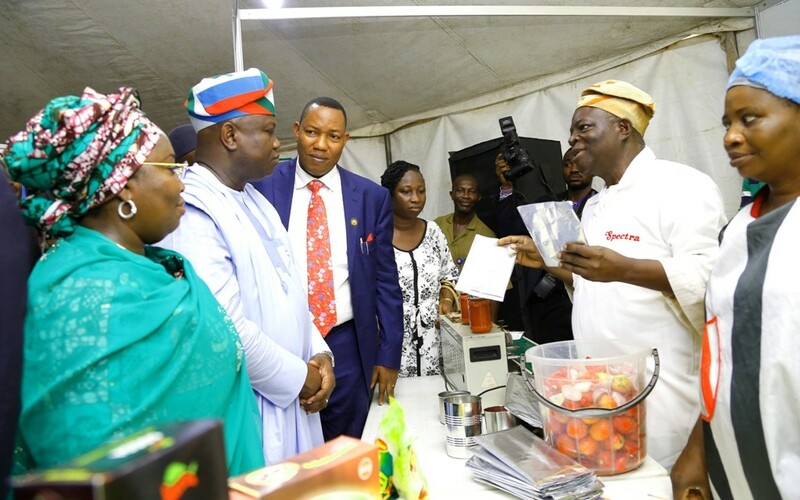 Lagos State Governor, Mr. Akinwunmi Ambode on Thursday said that investors willing to do business in the agric sector in the State can be rest assured of a ready market and returns on investment as the daily consumption of food items in the State is worth over N3billion daily. 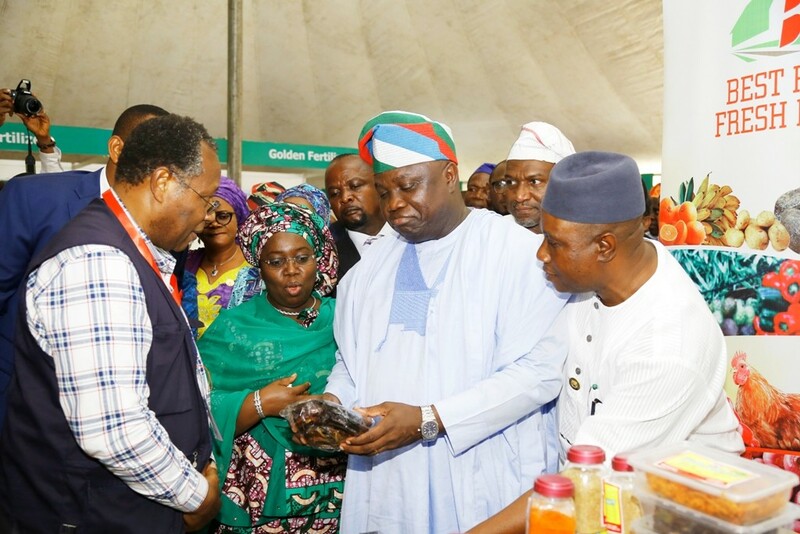 The Governor, who spoke at the maiden edition of the Lagos Food Security and Exhibition Summit with the theme “Actualizing Sustainable Food Security in Lagos State: A New, Comprehensive Agenda’, said his administration remains committed in its efforts towards maximising its comparative advantage in the sector to achieve food security. 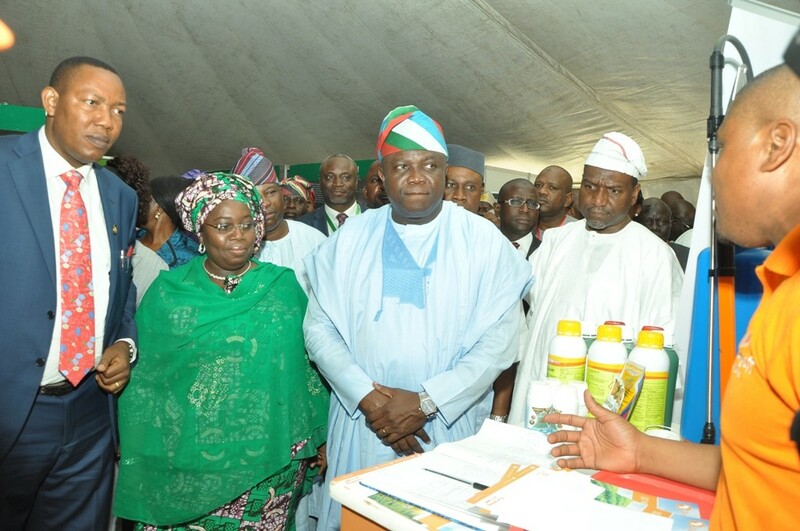 Lagos State Governor, Mr. Akinwunmi Ambode (right); President, Nigeria Agric Business Group, Alhaji Sani Dangote (right); Deputy Governor, Dr. (Mrs.) Oluranti Adebule (2nd left) and Special Adviser on Food Security, Mr. Sanni Ganiyu Okanlawo (left) at the exhibition stands during the Lagos Food Security Summit and Exhibition at the Airport Hotel, Ikeja, on Thursday, November 10, 2016. Also, the Special Adviser to the Governor on Food Security, Mr. Sanni Ganiyu Okanlawon, noted that that the summit was being organized to institutionalize a food security framework that would guarantee sustainable food security for its growing population. He said the summit was designed to realign emerging realities with new global trends on food safety, food processing, food storage, food handling, funding of agribusiness and agric insurance”, adding that it will attract major stakeholders from the Agricultural sector and academia, foreign and local investors, media, civil society and policymakers in government. 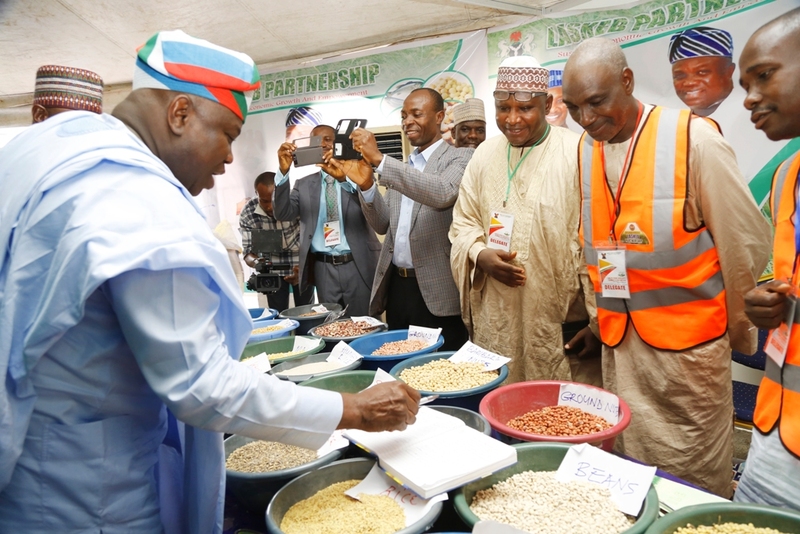 Earlier, Chairman of the Summit, Alhaji Sani Dangote, commended the Governor Ambode-led administration for leading being in the forefront in addressing the challenge of food security, saying that the State boasts of a large population with an economy ranked as the fifth largest in Sub-Saharan Africa, a bulging youth population and capital of the nation’s industrial base. He said despite the shortage of arable land in the State, the State Government can leverage on its comparative advantages to not only guarantee food security in the State, but also feed the neighbouring South West States.